June 21 to October 5. Winter - December 20 to April 12. Summer - June 26 to October 11. Please note that rates shown are per person / per night plus taxes. Infants stay free. Rates from $240 per person per night. Winter - Rates from $200 per person per night. Summer - Rates from $240 per person per night. Call toll free at 1-888-997-5654, or local at 403-522-1347 for reservations and information.  There is a two night minimum stay (unless a reservation is made two weeks or less prior to the date of arrival and there is availability for one night only).  Deposit: A 50% deposit of total reservation charge is required at time of booking. This deposit is non-refundable within 60 days prior to arrival. If cancelled before this date it is refundable in the form of a credit letter minus $150 in administration fees. The credit letter is valid for 1 year from the reservation date. Full payment is due 60 days prior to arrival.  Cancellations: if cancelled inside of 60 days of arrival, the full amount is non-refundable. Changes to dates booked are not allowed within 60 days of the arrival date.  A confirmation and deposit receipt will be sent out upon receipt of reservation.  Skoki Lodge has no control or responsibility for the weather and reserves the right to cancel any stay at anytime without notice. Safety in backcountry travel is important to the continued operation of the lodge and full refunds for your stay may be issued or deferred to a future alternate date. Rooms are located on the second floor of the lodge. Deception & Skoki – 2 single beds. Silvertip – 1 single bed. Fossil – 1 queen bed. Merlin – 2 single beds and 1 bunk bed. Molar – 3 single beds. 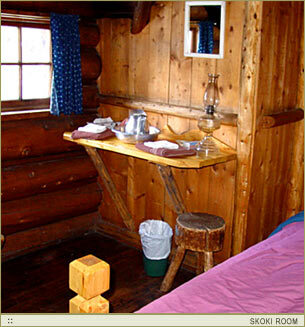 Cabins are located near the main lodge and heated by propane stoves. Riverside – 1 queen bed, 1 bunk bed, and 1 single bed. Sleeps up to 5 (minimum of 4). Wolverine – 3 single beds and 1 bunk bed. Sleeps up to 5 (minimum of 4). Honeymoon – 1 king bed. For groups of 10 or more, a 50% non-refundable deposit is required at the time of booking.Final payment is due 90 days prior to arrival. Inside 90 days of arrival, the full amount is non refundable.